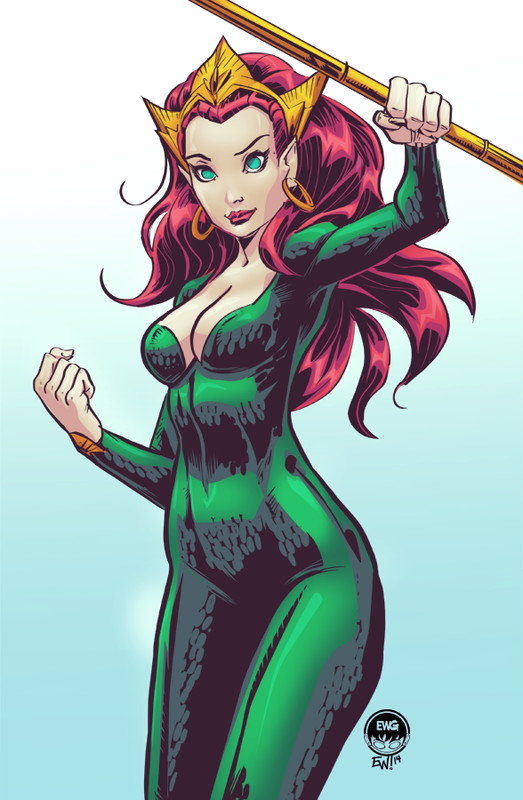 Didn't know much about her when I got this commission but really dig her look/ presence style in the images I googled. Only place I remember her from was Justice League on the episode of how Aquaman lost his hand to save their baby. She had a lot of costume variations over the years but I really dug this crown and body suit the best. I enjoyed in the inking process adding in the 'scale' pattern her outfit has. Penciled photoshop, inked in inkscape and colored in photoshop. This is an example of a full color over inks commission with no background. I sometimes opt to show all the way down to the feet but I often like to crop at the knees to make the figure fill the canvas as much as possible. I know in this case the client likes me to do it this way in almost all the work I've done for him.